There’s likely no other company on Earth that has defined its brand more deftly than Apple. Despite many examples that contradict its chosen set of associations, people generally think about perfectionism, ease of use, elegance, and innovation when they think about Apple. And due to its closed system of building its software and hardware in tandem and its long run as being the relatively virus-free alternative to Microsoft, the company has built a good reputation for security and privacy. Another choice line from that interview came when he said, “The truth is, we could make a ton of money if we monetized our customer—if our customer was our product. We’ve elected not to do that.” For the last few months, he’s made comments that were directly critical of Facebook’s entire business model on several occasions and even snuck in a thinly-veiled reference to its troubles giving the commencement speech at his alma mater, Duke University, in May. “We reject the excuse that getting the most out of technology means trading away your right to privacy,” he told the graduating students. Then he plugged Apple’s dedication to “collecting as little of your data as possible, being thoughtful and respectful when it’s in our care.” It’s all been the kind of thing that tech nerds quote-tweet with “sick burn” and “shots fired” captions. Earlier this week, Apple received praise when it announced that macOS Mojave will come with updates to Safari that will make it harder than ever for third-parties to use a technique known as “browser fingerprinting” to track your activities. As we explained on Monday, advertising technology companies often analyze “the type of browser you’re using, your operating system, graphics hardware, screen size, browser plugins, software versions, timezone, language, system fonts, and whether cookies are enabled, among other characteristics” to identify you for marketing purposes—even when you’re using incognito mode. This is one of the many ways that Facebook tracks users around the web and creates shadow profiles for non-users. When I say that we should be more attentive to Apple’s privacy moves now, while it’s seemingly doing good things, I don’t mean to imply that there are fundamentally cynical motives at play. Back in 2016, Apple took a stand against the FBI’s effort to break into the encrypted iPhone of the San Bernardino shooter and its insistence that it needed a backdoor for Apple’s encryption. The Justice Department accused the company of putting people at risk for the purpose of marketing. The reality is, the good publicity came along with Apple’s correct understanding that backdoors make us all less secure. It just so happens that a market opportunity aligned with the public good, something that is all too rare and shouldn’t be necessary for doing the right thing. We are all at the mercy of these virtually unaccountable companies making the decision to take advantage of their peers’ bad behavior. One reason Apple has been relatively good over the years is that it’s a smart company that has stayed in its lane. Another reason is that since the release of the iPhone, it has been rolling in cash. When you’re an embattled company like Facebook or Uber—just trying to kill all your competition in a newly emerging sector—you tend to do a lot of questionable things. For its part, Apple’s managed to duck responsibility for its own problems, like its abhorrent labor abuses and its schemes to avoid paying its fair share of taxes. But the days of coasting on its success are waning for Apple and all hardware makers. Apple’s core business is fine, and it’ll be fine for a long time, but it’s not the best way to show the growth that investors crave, right now. Hardware doesn’t need to be replaced as often as it used to, and people are less likely to feel the need to upgrade their smartphone every cycle the way they once did. And more people than ever are electing to buy used or refurbished phones. Apple still has its eye on smart speakers, augmented reality, and self-driving cars, but those profits are years away. This has led Apple to focus in on services—a small part of its business but one that has shown the most potential for growth. In its own deliberate fashion, Apple appears to see a market opportunity in the privacy debate that goes beyond polishing its own image. As headlines blared about Facebook’s latest data-sharing turmoil, the Wall Street Journal reported that Apple has been quietly planning to launch a new advertising network for the past year. It’s said to be a re-imagining of its failed iAd network that was shuttered in 2016. The service was founded to serve ads in apps on iOS in 2010, but advertiser quickly began to complain that it was too expensive and Apple was too demanding with its creative standards. As Facebook and Google pushed forward with cheaper ads that were micro-targeted using personal data, Apple fell behind. Those two companies controlled almost 60 percent of the entire digital ad market in 2017, according to research firm emarketer. It seems that Apple may smell blood in the water and hopes to grab a chunk of the industry. What’s troubling is that Apple holds a lot of power as the manufacturer of the devices millions of us use to see ads online, in its app store, and through its Safari browser. The ad industry is in a pivotal moment that could lead to a reorganization of the web as we know it. Europe’s GDPR regulations require unprecedented privacy disclosures and user permissions. When the new rules went into effect last month, the web was thrown into chaos and the future of programmatic advertising based on data collection is now an open question. We’re also seeing a little movement on regulations in the U.S. While Facebook weasels its way around the new laws and does everything it can to keep doing business as usual, Apple is complying with GDPR and turning it into an opportunity to be seen as extraordinarily transparent about the data it collects. To be clear, we have no certainty of what Apple’s grand plan is, and in its usual fashion, it’s not telling us. It really might just be feeling out ads and enjoying a moment to get some good PR. 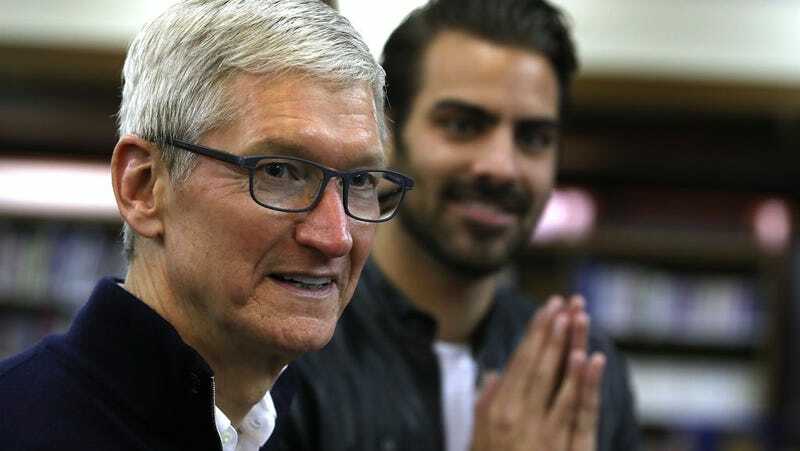 But by building methods of circumventing Facebook and other advertisers’ dirty tactics directly into its products, one could imagine that Apple is quietly trying to kneecap competitors as it dips its toes back into the ad market. The company has a clean slate to grow an ad business that isn’t tainted, and it has its core hardware business to pay the bills while Facebook only has advertising. The idea of a more responsible company stepping in to reorganize the awful world of online advertising isn’t particularly troublesome, and the short-term outcomes will probably be nothing but positive. But Apple is flirting with the same issues raised by Google’s gradual implementation of adblocking and setting standards for acceptable ads online. There’s a thin difference between saving an industry from itself and becoming an unstoppable gatekeeper for what kind of ads are acceptable and how they’re allowed to be served. The Wall Street Journal claims that Apple has been meeting with companies like Snap and Pinterest to discuss distributing its ads in their apps. But given enough leverage, Apple could theoretically make its ads a prerequisite for inclusion in its app store. It already takes a share of ad revenue from apps anyway. In April, Vanity Fair reported that acrimony between Facebook and Google really began to heat up a couple of years ago when Facebook started exploring the idea of launching its own app store. While that hasn’t happened yet, Apple didn’t like the idea of competition and felt hamstrung by the possibility that pushing Facebook out of its app store as retaliation would only drive customers to Google’s Android platform. Generally, more competition is welcome. If Apple is giving Facebook and Google headaches, we say that’s great. But it’s a thorny issue when we’re talking about a few billion-dollar companies exchanging places on the ladder as they strive to be trillion-dollar companies. It’s just not enough for the least bad megacorp to keep the evil ones in check. Free markets really don’t police themselves, as the telecoms clearly demonstrate with their practice of tolerating each others mini-monopolies. The Supreme Court is expected to rule on an incredibly important case this month that will set a precedent for how much power law enforcement has when it comes to using our devices for location tracking. If the court ends up deciding that the government has a loophole to follow us around without a warrant just because we’ve all bugged ourselves, we can’t just hope and pray that Apple will build some new feature to protect our rights. We need clear laws regarding security and privacy, and as a society, we need a higher bar for what we expect. This, of course, is a tricky balancing act. Regulators can overstep and lawmakers are often really stupid. Legislation can be written by lobbyists with tricky loopholes that end up benefiting giants and harming upstarts. And if that happens, regulations should be adjusted. But unless you have a lot of money to buy up a chunk of shares, or have the pull to fire off that perfect tweet that launches a boycott, you have little control over how a corporation will help you. You just have to wait until they decide their interests align with yours.